The Atlas 2A is a two-and-one-half stage rocket capable to lifting payloads of 3,070 kg (6,760 lb) into a geostationary transfer orbit. It features no strap-on solid rocket boosters and is the least powerful version of the Atlas family. Atlas is the name of a family of booster stages. Centaur is a family of high-energy, restartable upper stages. 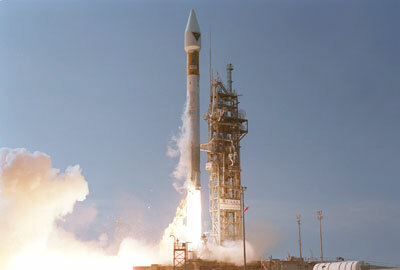 Atlas 2A is the designation for an Atlas 2A booster combined with a Centaur 2A upper stage. The Atlas 2A is a two-and-one-half stage launch vehicle. The Centaur upper stage is mounted on top of the one-and-one-half stage Atlas booster. The Atlas booster is 10 feet in diameter and 81.7 feet long. The propellant tanks are a thin-wall, fully monocoque, corrosion resistant stainless steel construction. The fuel tank, which contains RP-1, and the oxidizer tank, which contains liquid oxygen, are separated by an ellipsoidal intermediate bulkhead. Structural integrity of the tanks is maintained in flight by the pressurization system and on the ground by either internal tank pressure or application of mechanical stretch. The Atlas uses the Centaur avionics system for guidance, flight control, and sequencing functions. An external equipment pod houses Atlas systems such as range safety, propellant utilization, pneumatics, and instrumentation. Atlas booster propulsion is provided by the Rocketdyne MA-5A engine system, which includes the sustainer engine and booster engine system. All engines are ignited before liftoff and develop a total sea-level-rated thrust of 490,000 pounds. The section containing the booster engine is jettisoned (booster package jettison [BPJ]) at an axial acceleration of 5.0 g. Flight continues powered by the sustainer engine ("sustainer phase" flight) until propellant depletion. The Atlas is connected to the Centaur by the interstage adapter. This aluminum structure provides the structural link between Atlas and Centaur. The Atlas is separated from the Centaur by a flexible linear-shaped charge system attached to the forward ring of the interstage adapter. 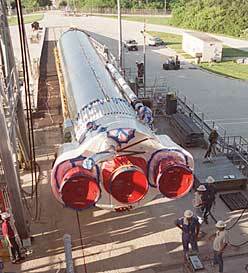 Centaur, the Atlas 2A upper stage, is 10 feet in diameter and 33 feet long. It employs high-energy liquid hydrogen and liquid oxygen propellants separated by a double-wall, vacuum-insulated intermediate bulkhead. The propellant tanks (like those of the Atlas stage) are of thin-wall, fully monocoque, corrosion-resistant stainless steel construction. Tank stabilization is maintained at all times by internal pressurization or application of mechanical stretch. Centaur avionics packages, mounted on the equipment module, control and monitor all vehicle functions. Centaur avionics perform the inertial guidance and attitude control computations for both Atlas and Centaur phases of flight, and control Centaur tank pressures and propellant use. The Centaur propulsion system uses two RL10A-4-1 engines with extendible nozzles manufactured by Pratt & Whitney. Each engine is has a rated thrust of 22,256 pounds. The Centaur engines are restartable and are capable of multiple firings in space, separated by coast phases. 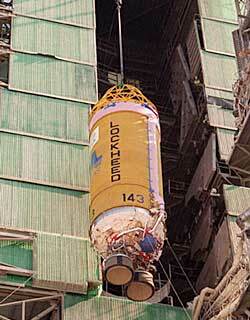 The stub adapter and equipment module are attached to the forward end of the Centaur. The stub adapter is bolted to the forward ring of the Centaur tank and supports the equipment module and payload fairing. The equipment module attaches to the forward ring of the stub adapter and provides for mounting of the Centaur avionics and the spacecraft adapter. The payload fairing protects the spacecraft from time of encapsulation through atmospheric ascent. 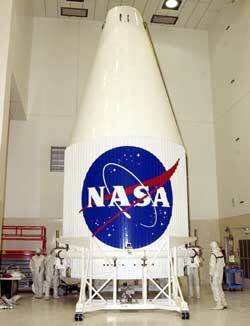 The fairing used by the TDRS-J mission is 14 feet in diameter. The payload fairing is a two-half-shell structure constructed of aluminum with vertical, split-line longerons. It consists of a cylindrical section topped by a conical nose cone and a spherical cap. The conical section external surface of the fairing is insulated with cork to limit temperatures to acceptable levels. Non-contaminating thermal control coatings are used on internal surfaces to reduce incident heat fluxes to the spacecraft. Approximately 1 minute after Atlas booster jettison, the payload fairing is jettisoned. The mechanical interface between the TDRS-J spacecraft and the launch vehicle is provided by a Lockheed Martin Astronautics standard adapter, 47-inch-diameter adapter and a payload separation system. Launch site: SLC-36A, Cape Canaveral AFS, Fla. Launch timeline - Chart with times and descriptions of events to occur during the launch. Ground track - See the trajectory the rocket will follow during its flight. TDRS-J - Description of this NASA tracking and data relay satellite. History of TDRSS - Past launches of TDRS satellites and their current status. Atlas index - A directory of our previous Atlas launch coverage. The conception, design, development, testing and launch history of the Saturn I and IB rocket is documented in this forthcoming three-disc DVD. NEW 3-DISC EDITION This exceptional chronicle of the historic Apollo 11 lunar landing mission features new digital transfers of film and television coverage unmatched by any other. Astronomy Now presents Hubble: the space telescope's view of the cosmos. A collection of the best images from the world’s premier space observatory. Bring a unique piece of space history to your living room. Two- and six-disc Apollo 15 DVDs will be shipping soon.